Whatever the size of room or interior style, there’s a Kährs floor that will enhance the space. 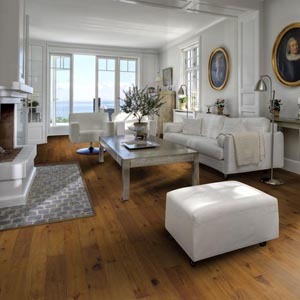 Our wood floors come in many wood species, sizes, patterns and finishes. Whichever surface treatment you choose for your Kährs floor, you can be sure that it will both enhance and protect the natural beauty of the wood. All Kährs surface treatments are naturally free from solvents, formaldehyde and isocyanate. They also make the floor really easy to clean and maintain. When Kährs launched Woodloc® in 2000 – the first glue-free joint system in the world – it revolutionized the wood flooring industry. This ingenious joint system locks the boards together mechanically, creating a completely gap-free floor.